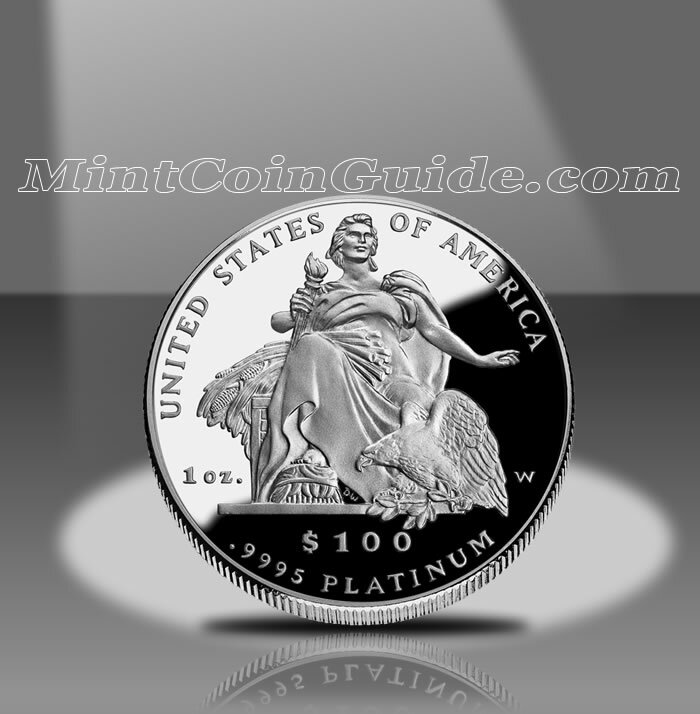 The 2004 American Platinum Eagle Coins continued the trend started the year before off slipping mintages for both the proof and bullion versions of the strike. The Mint continued its policy of striking a new reverse design annually to the Proof Platinum Eagles. Featured on the 2004 Eagle was a design based on a sculpture known as "America" located by the U.S. Customs House in New York City. Without exception, every Bullion Platinum Coin mintage dropped for the year. Taking the largest hit were the two smallest sized coins (1/4 Ounce and 1/10 Ounce), which both lost near the 7,000 mark. Proof Platinum Eagles also ended up with lower mintages across the board. Once again, the smallest sized coins had the largest losses. The chart below shows the total mintage of 2004-dated Proof Platinum Eagles which includes the number sold as part of the Platinum Eagle 4-Coin Set (of which 3,990 were sold). The 2004 Platinum Eagles marked the eighth year in which the US Mint produced the Platinum Eagle line. 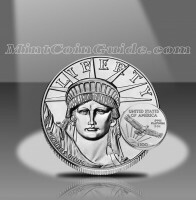 Bullion Platinum Eagles were available from the Mint’s network of authorized purchasers for most of the year. The Proof Platinum Eagles were not available until fall of 2004. Bullion Eagles were sold by the US Mint through its network of authorized purchasers for a small premium above the current spot price of the platinum contained within them. United States Mint sculptor-engraver Donna Weaver designed the reverse of the Proof Platinum Eagle based on the Daniel Chester French sculpture titled "America" found near the U.S. Customs House in New York City. A ‘W’ mintmark on each Proof Eagle indicates it was struck at the US Mint’s facility in West Point. John Mercanti designed the "Portrait of Liberty" that is featured on the obverse (heads side) of all of the Platinum Eagles. Thomas D. Rogers Sr. designed the reverse of the Bullion Eagle to show soaring eagle design which has been on the Bullion Eagles since their debut. The new reverse design on the Proof Platinum Eagles was designed by Donna Weaver based on the "America" sculpture by Daniel Chester French near the US Customs House in New York City.